I saw this GREAT idea on one of my favorite blogs, eighteen25. I thought this would be a fun way to teach the kids about Easter and get them excited. We've had a few great chats about why we celebrate Easter and I think that despite all the egg related activities, the kids really get what it is about! It has turned out so great that I wanted to spread the word. It is TOTALLY easy. I wrote on the eggs with a sharpie and stuck them in an egg carton. 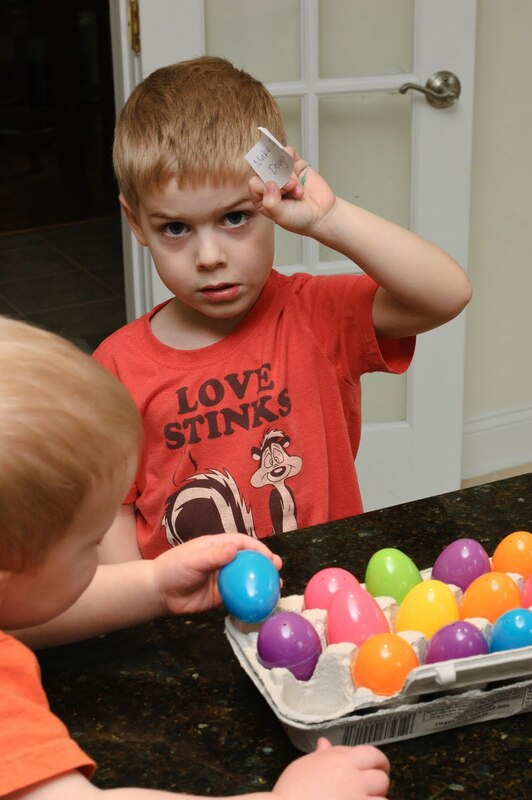 I don't even put the activity idea paper in the egg until right before Lila gets home from school so I can decide what I feel up to that day. Yesterday it was "go to the park with your friends" and they were thrilled. (Zack doesn't LOOK thrilled, but trust me... they love this! If you end on Easter and do a dozen eggs you need to start TODAY (the 13th). 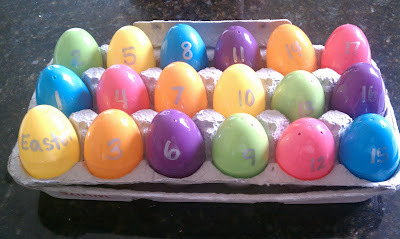 I had an 18 egg carton so the kids and I have been doing this for a few days now. They LOVE, LOVE, LOVE it. Seriously. Nat and I will be posting our activity ideas on her super cute blog Corduroy Dreams. We'll post a new activity each day so come check us out if you want some ideas. One great idea that I had to plan ahead for was to watch "Easter Dream". As our church's librarian, I saw this in the library and thought it would be a perfect Sunday activity. Johnny ordered it (for $4.50... seriously cheap!) and it should be here in a few days. -colored Easter pictures for the local grocery store coloring contest and we got ice cream while we were there!! Tons more to come so check out Nat's blog! CUTE!! I love this... my mom used to do it with us growing up and it was alway fun..
Easter count down, eater play dough, birthday parties, (those cakes!!) you are ROCKING MY WORLD. Would you consider coming to be my mom?